Joker kidnaps Gordon (again? ), and uses the items he gathered via Penguin and Catwoman to broadcast an “untraceable” television talk show. Gordon is the first “guest,” and Joker attacks him with a baseball bat. After taking down a seemingly unrelated goon, Batman learns of the broadcast, and decides Harvey Dent must be the next target. Batman, Dent, and Bullock plan to use Dent as bait. 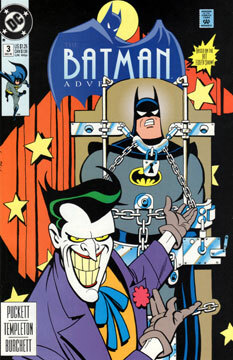 Later, Joker and his thugs kidnap Dent in his apartment, and manage to capture Batman in the bargain. The two prisoners join Gordon for the next broadcast. Joker tells the world he’s about to unmask Batman only to reveal… Harvey Dent! Batman, disguised as Dent, breaks his bonds and chases after the escaping Joker via boat, only to have the Joker escape. As with issue #2, I’m willing to cut these early issues some slack. Nobody yet knew just how good the show was turning out to be, so holding the comics up to that bar isn’t really fair. This issue isn’t bad in the sense that the characters seem to behave as themselves. But the pacing was uneven. There’s a three page bit where Batman goes after an unrelated thug, and the whole thing serves as setup to place Batman in front of a video store window as the Joker makes his first broadcast. That was too long and unnecessary. And the Joker gets away far too easily. Adequate. Again, in these early days, the precepts of the show were not yet ingrained in all our minds. Some of Templeton’s characters appear a little too detailed when compared to the simple lines of Batman and Dent. As Harvey Dent appears, this clearly takes place before his scarring. I don’t see anything that would prevent this story from fitting into the animated series at any point before that. Only Harvey Dent in a bathrobe, if you’re into that kind of thing. Worth it if you see it cheap. But don’t make an effort. “It has a lot more going for it than against…” That’s a good point. I agree whole heartedly!